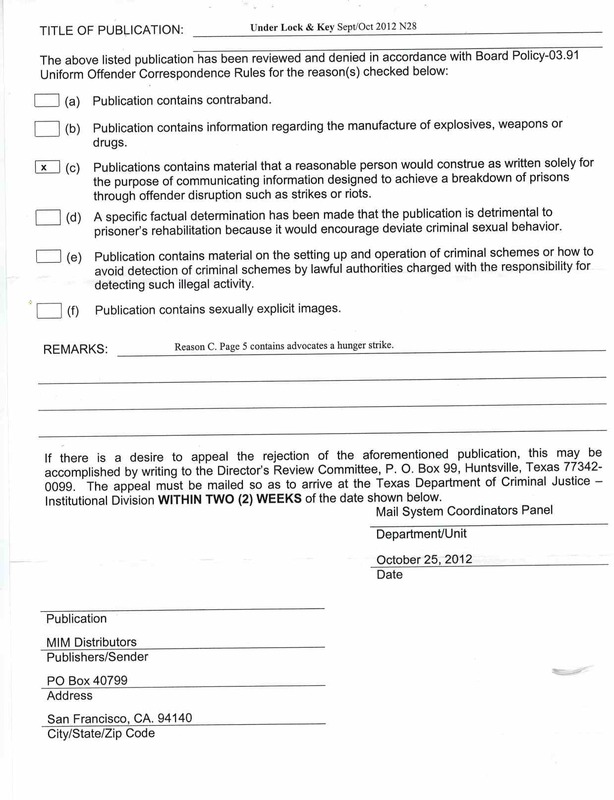 11/26/2012 Prisoner appealed, Still "reviewing it"
Prisoner filed a DC410 appeal form and a month later the Asst. Supers office says they are still reviewing this letter. 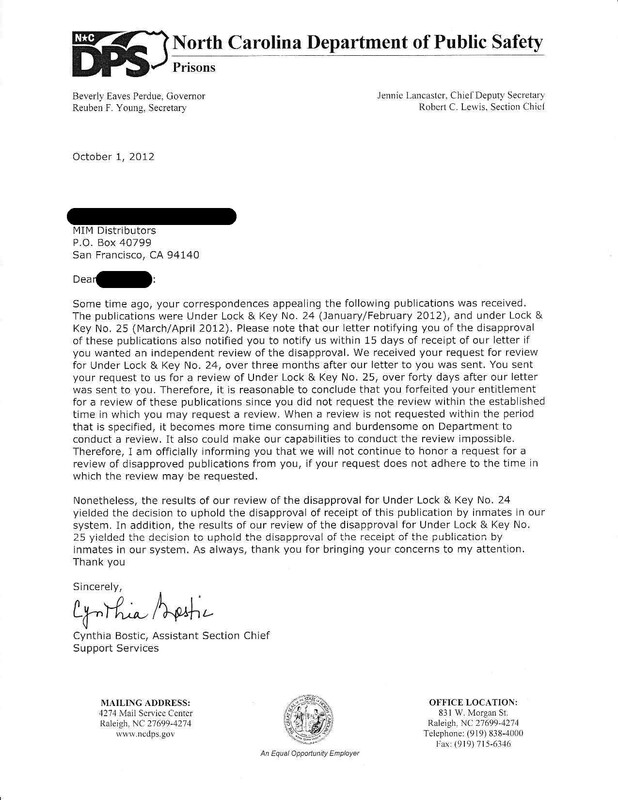 This letter is in response to a "Letter To Publisher" from Fay Lassiter dated October 30, 2012. In a previous communication you state that it is overly burdensome to review censorship decisions more than fifteen days after the notice. Trust me, this is quite burdensome for us as well, and we do not have a paid full time staff to address these issues as your agency does. So I apologize for the delayed response, and will respond as soon as I am able in the future. But as you can see by checking the USPS Certified Mail tag on the letter, our mail retriever did not receive this letter until last week. I was holding the enclosed letter dated 12 November 2012 until I was able to get ahold of the most recent letter as I wanted my letter to be relevant to the most recent information. All that said, such time restraints from your office do not preclude you from following the law in handling the mail between outside parties and the prisoners being held by your agency. I am requesting an independent review of the enclosed decision to censor Under Lock & Key No. 28. 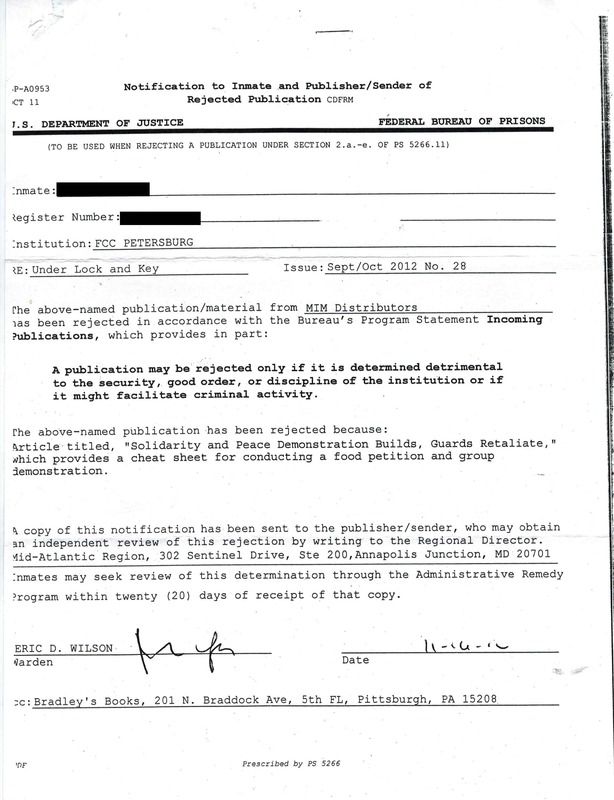 Once again there is no "Reason for Disapproval" listed on page 2 of the notice. Page 1 cites pages 2 and 13. 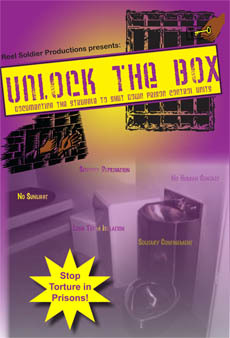 Page 2 is merely a description of what Under Lock &Key and MIM(Prisons) are that is printed in each issue of the newsletter. This statement reads in part, "We encourage prisoners to join these battles while explicitly discouraging them from engaging in any violence or illegal acts." So I do not understand how this statement violates your mail rules. Ms. Lassiter seems to have an issue with page 13 because it criticizes decisions she made regarding the censorship of previous issues of Under Lock & Key. We are very familiar with Ms. Lassiter's personal opinions on Under Lock & Key and whether or not prisoners should read it. But we hope that you will agree with us that she does not have the discretion to decide what prisoners in North Carolina are allowed to ready, only to apply the "legitimate penological interests" standard. Thornburgh v. Abbott, 490 U.S. 401, clearly asserted that you cannot censor things you find politically repugnant. Furthermore, Johnson v. Raemisch, 557 F.Supp.2d 964 (2008) directly addressed the issue of state agencies censoring materials that are critical of their agency claiming it was a "security threat." The courts are clear that this type of behavior is against federal laws. 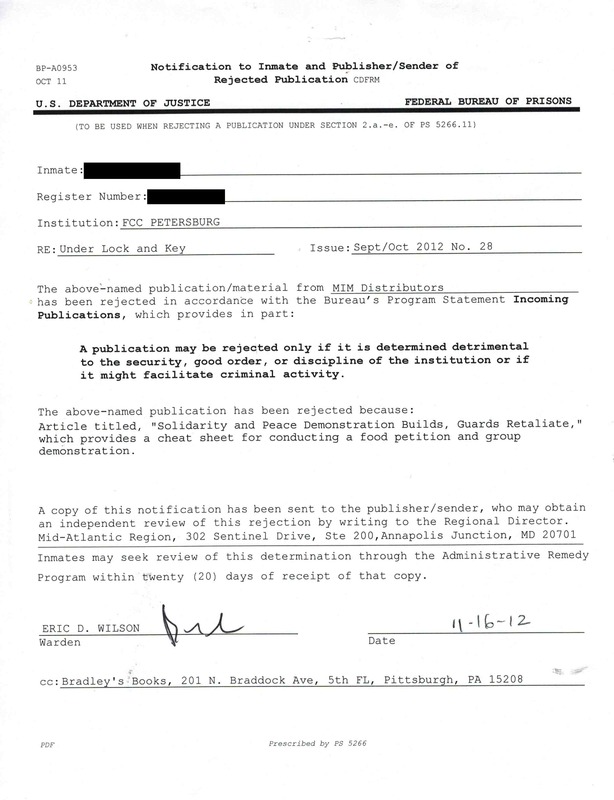 On this same subject I have recently been notified by prisoners in Marion that a petition addressed to James French is being censored there because "MIM Distributors is on the disapproved publication list." 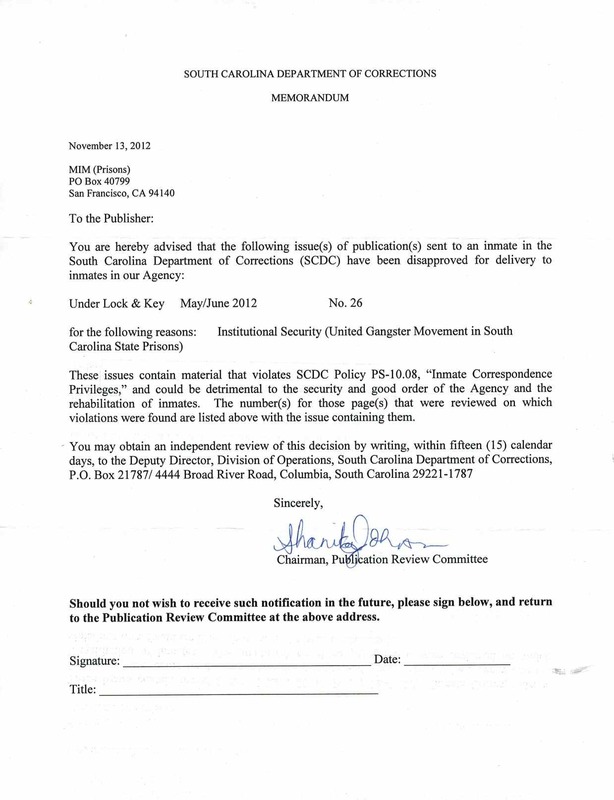 I know you know this is not legal as we have had long discussions with you about the disapproved publication list in North Carolina, and how it cannot be used to censor any mail from an organization or company. You should also be aware that prisoners have a right to "petition the government for a redress of grievance," which was the purpose of the petition. Please let me know whether or not you agree with my interpretation of the law described above and whether you will allow prisoners in North Carolina to receive Under Lock & Key No. 28. All that said, such time restraints from your office do not preclude you from following the law in handling the mail between outside parties and the prisoners being held by your agency. 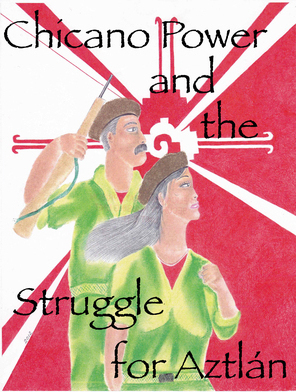 I am requesting an independent review of the enclosed decision to censor Under Lock & Key No. 28. Once again there is no "Reason for Disapproval" listed on page 2 of the notice. Page 1 cites pages 2 and 13. 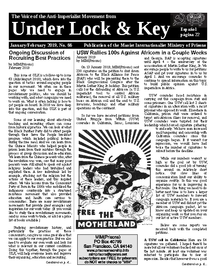 Page 2 is merely a description of what Under Lock & Key and MIM(Prisons) are that is printed in each issue of the newsletter. This statement reads in part, "We encourage prisoners to join these battles while explicitly discouraging them from engaging in any violence or illegal acts." So I do not understand how this statement violates your mail rules. 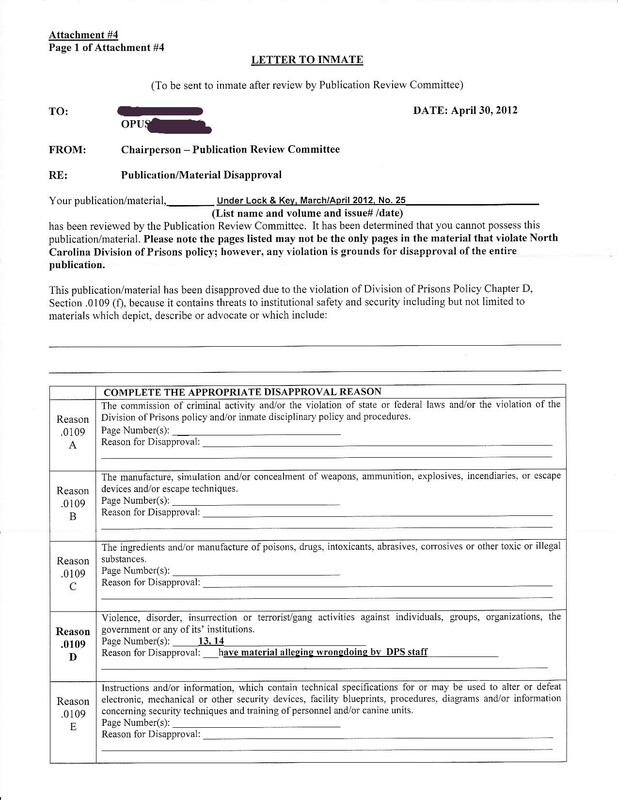 04/30/2012 Censorship upheld by chairperson because ULK25 "have material alleging wrongdoing by DPS staff"
We would like to appeal the censorship of the above-listed publication. Please see attached notificatino. 10/01/2012 Asst. Section Chief decides "to uphold disapproval of the receipt of the publication by inmates..."
We are in receipt of your two letters dated October 1, 2012 addressed to XYZ, responding to h inquiries made in June of this year. In one you state that conducting reviews of decisions to censor mail is time consuming and burdensome when the request is delayed. In the other letter you respond to her request for statistics on the review process stating that you do not provide such information. How is it that so much time and effort goes into the review process and after over a year of requesting substantiation for your decisions you have not provided any? Certainly you can provide us with documentation of the reviews of our own mail. As I have pointed out to you repeatedly, the notifications of censorship that we receive from your staff is hit or miss in providing any justification for the decision to censor. Sometimes they list a page number, but no further information. Sometimes we don't even get that. And I have not seen one instance where your "review" of their decisions has provided any justification. Is there or is there not any evidence that an independent review process exists within the NC Department of Public Safety? If there is, can you please provide documentation of such for the incidents of censorship involving mail from MIM Distributors for the past year?